You are here: Home / Champion Generator Reviews / Champion Generator Reviews | Which Portable Generator Is Right for You? If you’re looking for Champion Generator Reviews you’ve come to the right place. We review, discuss and recommend many of the best Champion portable generators that we feel are worth your money. If you are in the market for an affordable, reliable, and easy to use portable generator, then Champion Power Equipment should be one of the top brands on your list. Whether you have owned a generator previously or plan to purchase your first generator in the near future, you must have heard of the company Champion. Since its foundation in 2003, Champion has built up a reputation for manufacturing some of the best power generation equipment in the entire North American region. They make all kinds of generators, from portable inverter generators to conventional open-frame models, industrial generators, and home backup systems. Whether you are a camper looking for something small and quiet, or a construction crew who requires a generator that is powerful and robust, Champion Power Equipment has a model to fulfil your needs. Having sold over 2.5 million units in the past 10 years, this company is quickly gaining popularity in the North American market. Their aggressive pricing makes them a formidable adversary to some of the better-established brands, such as Honda and Yamaha. Champion is also one of the pioneers in the field of dual-fuel portable generators. Products such as the 100204 3100-watt portable inverter generator and the 100275 7200-watt open frame generator are fine examples of Champion’s dual fuel technology. With a dual-fuel generator, you can use either gas or propane to operate the unit; this gives you greater flexibility in terms of fuel options and helps lower emissions since propane burns cleaner than gasoline. Propane is also easier to store since it does not emit fumes, and has a much longer shelf life compared to gasoline. Depending on where you live, propane will typically be cheaper than gas. Champion even develops “Hybrid” generators, these are inverter generators, but optimized to be even quieter and more compact. Champion claims that their digital hybrid generators equipped with Quiet Technology are up to 50% quieter and 20% lighter than traditional 3500-watt portable generator models from competing manufacturers. In this article, we shall look at some of the most popular portable generator models from Champion. Our focus will primarily be on generators within the 3000 to 3800-watt range, which is the optimal spectrum for recreational usage like tailgating or camping. If you wish to have more power, you can hook up two generators of the same model through a parallel connection. Are you confused between a standard generator and inverter generator? Do not worry, we shall discuss about the main differences between these two types of portable generators. This article will also cover some of the important concepts like starting watts vs running watts, how to size your generator, etc. Finally, we will look at some tips for operating and maintaining your portable generator. 3800-watt, dual-fuel, RV Ready generator, with electric start. Champion generator review. Featuring Intelligauge, Volt Guard and Cold Start Technology. Dual Fuel Portable Generator : Powered by propane or gas. Versatile. Will run for 9 hours at 50% load when the 3.4-gallon fuel tank is full. Will run for 10.5 hours at 50% load when using a 20-pound propane tank. Power up the 224cc Champion engine with the handy toggle switch, battery included. Intelligauge : Keeps track of voltage, hertz and run-time hours. Designed with a low oil shut-off sensor, this unit has a 0.6-quart oil capacity (included 10W-30). ✓ View or download the MANUAL for the Champion 76533. Perfect for recreational workloads such as tailgating, camping, fishing, etc. the Champion 76533 is a versatile and reliable 3800-watt portable generator that comes with some neat convenience features, which are sure to make hook-up and operation easy for the average user. For starters, this generator is a dual-fuel model, which means it can operate on both gasoline as well as propane (LPG). This feature is something we are beginning to see more of in modern portable generators, since the option to run a generator on propane can prove to be extremely valuable in the right scenario. You typically carry propane tanks around with you when you go on a camping trip, since propane fuels stoves and heaters. You can use the same propane supply to run your generator, which will power the 15,000 BTU air conditioner in your RV, or a refrigerator. One of the major benefits of using propane is the fact that it burns more efficiently, and reduces carbon emissions significantly compared to gasoline. Propane is also cheaper than gasoline (costs may vary depending on where you live), and it is much easier to store since the chemical composition of propane does not degrade over time as easily as gasoline. 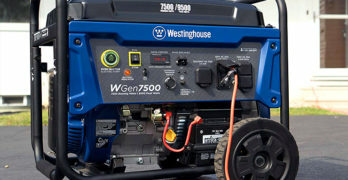 However, the Champion 76533 is not the only dual-fuel generator on the market to provide these advantages, there are several competing open-frame dual fuel generators such as the Duromax XP4850EH (3850-watts running), and the WGen3600DF from Westinghouse (3600-watts running). What truly makes the Champion 76533 unique, and in our opinion the best 3800-watt dual fuel open-frame on the market, is its ease of usability. For example, the Duromax XP4850EH is capable of generating an extra 50 running watts compared to the Champion 76533, but it also weighs 130 pounds as opposed to the 122 pounds of its Champion counterpart, and lacks a digital display. Not to mention, most online marketplaces have the XP4850EH listed at about 50 dollars higher compared to the Champion 76533. Intelligauge allows you to keep track of voltage, hertz and run-time hours. The Westinghouse WGen3600DF costs as much as the Champion 76533 and is lighter by nearly 13 pounds, which is a big deal for campers and tailgaters. However, it also generates 200 watts less in terms of running power, and is a decibel louder than the Champion 76533 at 69 dBA. We really like the fuel switching control on the Champion 76533; it employs a dual section switch with a sliding plastic cover. You slide the cover to the left, you expose the gas knob, slide it to the right, and the LPG/ propane switch is ready for use. There is a digital display on the control panel, which helps you keep track of voltage, hertz, and run-time. The Champion 76533 is ready to go right out of the box, all you have to do is add oil and connect the battery. Once you have done that, you can fill it up with gasoline and connect a 20-pound propane tank with the included LPG hose. A wheel kit is also provided which you can attach if you plan to roll the generator around (handy on jobsites and farms). There are a total of four outlets – 120V 30A RV (TT-30R), a 120V 30A locking outlet (L5-30R) and two 120V 20A household outlets (5-20R). Powered by a 224cc Champion OHV engine, the Champion 76533 equipped with electric start so you can get it running with the push of a button. Low oil shutdown will prevent it from functioning when oil levels get too low, and the automatic voltage regulation + surge protection system will ensure a steady supply of clean AC power to all your appliances, and guarantees immediate system shutdown in the event of an accidental power surge. The Champion 76533 is EPA certified, CARB compliant, and comes with a limited 3-year warranty. Runtime is 9 hours on gasoline, and 10.5 hours on propane (50% load). 3100-watt portable generator. Champion generator review. 3100 starting watts / 2800 running watts — can handle your essentials during an outage. Up to 8 hours of run time at 25% load when the 1.6-gallon tank of gasoline is full. Fully assembled with hassle-free set up, the foldaway U-shaped handle makes it easy to store, while the built-in carrying handles and never-flat tires in the included wheel kit. The 75537i is probably the best Champion inverter generator for home and recreational use. Not only is this generator extremely compact and highly efficient, but it is also convenient to use. Whether you are camping in a tent or relaxing inside the RV, you do not have to walk up to the generator in order to get it started. Just pick press a button on the wireless remote, and then your Champion 75537i will turn itself on within a fraction of a second. This feature comes in handy especially if it is raining heavily, or if you are camped in a snowy place. The Champion 75537i produces extremely clean AC power, with a THD (Total Harmonic Distortion) of less than 3 percent. If you want to power delicate electronics such as laptops or cellphones with a generator, it should have a THD of less than 5%. Typically, we use inverter generators for powering electronic equipment, and standard open frame generators as backup units or jobsite generators. This is because inverter generators produce a much more stable and “clean” AC current compared to standard generators. Inverter generators are more expensive compared to standard open frame units, and this is because of the complicated electronic circuitry that goes into these machines. We will talk more about them in the “Inverter vs Open Frame Generator” section of this article. For now, all you need to know is that the Champion 75537i will run quieter and cleaner than any standard open-frame model on the market. It costs more than the Champion 76533 (the dual fuel 3800-watt Champion generator), even though the 75537i generates 900 watts less in terms of continuous/ running power. The runtime is also slightly lower at 8 hours on a full tank of gas (no dual fuel option), compared to the 9 hour runtime of the 76533. This is not the runtime on 50% load either; it is just the runtime on 25% load, whereas the 9-hour figure for the open-frame 76533 factors in a 50% load. So, why should you purchase the 75537i if it costs more, runs for a shorter time between refuels, and does not have a dual-fuel option? Well, the 75537i is an inverter generator unlike the 76533, which is a conventional open-frame unit, so you will get plenty of advantages in terms of noise reduction, efficiency, and power quality. Even though the 75537i generates 2800 watts of continuous power, this AC energy is extremely clean, closely resembling a pure sine wave AC signal. Are you confused about sine waves and AC current? Do not worry; we shall discuss those concepts later in this article. To make a long story short, the less THD (Total Harmonic Distortion) you have in the output AC current, the “cleaner” it is. Clean power is extremely important for running sensitive electronics such as phones, LED lights, and laptops. The Champion 76533 has a THD of 11.53%, as opposed to the 3% THD of the 75537i. You can use the 76533 for powering TV’s, washing machines, refrigerators, AC units, and larger appliances, but we would not recommend it for smaller electronic devices with more complicated circuitry. The ports are as follows- a single 120V 30A RV (TT-30R), two 120V 20A household outlets (5-20R) plus a 12V DC automotive-style outlet with a dual USB adapter and 12-volt DC battery-charging cables. You will not find the 12V outlets on the 76533, nor does it have the dual USB adapter ports. Plenty of outlets to meet your power needs. The 75537i is also significantly quieter, at just 58 decibels (measured at operating distance of 23 feet). To put things in perspective, the 76533 generates 68 decibels of noise at the same distance, which is literally twice as much noise (every 10-decibel increase doubles the amount of noise, since decibels work logarithmically). The 75537i weighs just 83.8 lbs. while the 76533 weighs 122 pounds (it weighs 31 percent less). Despite having a slightly shorter runtime, the 75537i is actually more fuel-efficient compared to the 76533, the lower runtime is because of the smaller gasoline tank (1.59 gallons vs 3.4 gallons). 7500-watt Dual Fuel portable generator. Champion generator review. Rugged and Powerful – Equipped with durable steel frame. Will run for 8 hours at 50% load when the 6.0-gallon fuel tank is full. Includes a 3.3-foot propane hose with a built-in regulator. ✓ View or download the MANUAL for the Champion 100165. This is a 7500-watt version of the 76533. It contains all the technologies you will find in the smaller 3800-watt 76533, such as Intelli-guage (digital display on the control panel), Low Voltage Protection, Low Oil Sensor, electric start, Cold-Start, etc. We recommended the 76533 for jobsites, home backup and recreational usage. Think of the 100165 as a slightly more capable 76533, it generates 97% more continuous power, as well as an extra 4625 watts of starting/ surge power. You can run multiple 10,500 BTU wall mounted air conditioning units with this generator, or you can use it to power the 15000 BTU air conditioner in your RV, with plenty of power to spare for the water heater and refrigerator. You can power 4-5 tools simultaneously with the 100165, or use it to run a 2HP air compressor. Capable of using both gasoline as well as propane; the Champion 100165 can be attached to a 20-pound external propane tank, which will run the generator for up to 5.5 hours at 50 percent load. Alternatively, you can fill up the 6.1-gallon capacity gasoline tank; this will allow the 100165 to function for up to 9 hours at 50 percent load. The safety fuel selector lets you swap between gas and propane on the fly, and a digital display helps you monitor the voltage, hertz, and runtime. Noise levels are a little higher with this one (74 dBA at 23 feet), mainly because of the large 439cc 4-cycle OHV Champion engine, which puts out 15 horsepower. This engine is built to last, and is one of the most powerful in its class. The Champion 100165 features dual 120V duplex outlets (5-20R x 4), a single 120/ 240V twist lock receptacle (L14-30R x 1), and a single 120V twist lock outlet (L5-30R x 1). It also comes with a 10” tubeless wheel kit and a 3.3 Ft LPG hose + regulator combo. There is a 2-year limited warranty on this product as opposed to the 3-year warranty you will find on smaller Champion models, but that is mainly because of the fact that this unit is expected to be used in a commercial or industrial setting as opposed to the 76533 which is more of a home/ recreational generator. The 100165 can power 240V equipment, a feature that is extremely valuable to construction crews. It also means that you can use the 100165 for powering your home HVAC system or pool pump unit in the event of a power failure. This generator is fully RV Ready, thanks to the TT-30R 30-ampere outlet, and it is equipped with a USDA approved spark arrestor. Keep track of voltage, hertz and run-time hours to easily monitor power output. The battery for electric start is included alongside the generator, all you have to do is take the unit out of the box and connect the battery leads, pour in some engine oil (also included), add gasoline/ connect a propane tank, and you are ready to go. If you are looking for a portable home backup generator to supplement your existing stationary backup unit, then the Champion 100165 is a great choice. It will power your sump pump, furnace fan, home security system, window AC, TV, washing machine, water heater- all at the same time. For extra reliability, the engine can also be started with the pull-cord (recoil starter), if the battery fails and you are unable to use the electric start. This generator is EPA/ CARB approved for sale in all 50 states. 2000-watt portable generator. Champion generator review. This unit is NOT recommended for emergency home backup for air conditioners, stoves, furnaces or sump pumps. up to 9.5 hours run time at 25% load when the 1-gallon tank of gasoline is full. OUTLETS : Two 120V 20A household outlets (5-20R) and a 12V DC outlet with battery-charging cables, this inverter operates at 53 dBA from 23 feet – about the same noise level as a dishwasher running in the next room. Parallel Ready inverter can connect with another Champion 2000-watt inverter for 30 amps of power. The optional Parallel Kit (73500i) is designed to integrate seamlessly between two stacked inverters and comes with a standard 30A RV outlet. Ideal for camping or tailgating. Power items around the RV like lights or TV or provide backup power for a few basics like lights, microwave, TV, modem/router or phone charger. ✓ View or download the MANUAL for the Champion 73536i. As you can tell from the suffix at the end of the model number, this is an inverter generator. Rated for 1700-watts continuous, and 2000-watts max, the Champion 73536i is a portable little companion that every camper and tailgater should consider purchasing. It is very quiet, produces clean AC power for all your sensitive electronic equipment, and weighs only 48.5 pounds so anybody can easily lift it on/ off the back of a truck. The Champion 73536i can power your portable heater in a hunting shack, or a microwave oven in your home. You can also use it to power a 1000 – 1500 watt electric grill, or a TV. The main reason this inverter generator is so good for campers and tailgaters, is the fact that it is the quietest portable generator on this entire list. Generating only 53 decibels of noise (measured at a distance of 23 feet), the Champion 73536i reliably powers all your electrical and electronic appliances while making the same amount of noise as a dishwasher running in an adjacent room. The tiny, but highly efficient 80cc single cylinder OHV engine in this generator puts out just enough horsepower to generate up to 1700 watts continuously, with a surge wattage of 2000. RPM adjusts automatically based on the load, so can rest assured that only the minimum required amount of gasoline is being consumed at any given time. This is one of the major advantages of using an inverter generator, since they can vary engine rpm dynamically based on the amount of load. Conventional generators always run at a fixed rpm, so they are very limited in terms of fuel efficiency. If you use a conventional generator to power a 100-watt light bulb, the engine will run at the exact same speed that it runs at while powering a 15000 BTU RV air conditioner. However, if you use an inverter generator, the engine will throttle down significantly, saving you precious dollars in gasoline, and reducing the environmental impact through emissions. Exceptional high ratings from customers. We shall discuss more about how inverter generators do this in a later section of the article. One more thing to note is the noise emission – this generator does not make 53 decibels of noise all the time, that number is a value recorded for a specific load. If you are using the 73536i to power a laptop computer or modem/ router, it will generate even less noise. In some scenarios, you may require more than 1700 watts, and Champion has a solution to that problem – hook up two 73536i generators in parallel to double the power output. The fully enclosed frame has a carry handle on the top, and the 4 pole-like structures on each edge act as support beams for the parallel generator (you can stack one of top of the other). Even though the Champion 73536i has a tiny 1-gallon fuel tank, it will run for up to 9.5 hours on 25 percent load, and is equipped with a special economy mode to further decrease fuel consumption. It outputs single-phase 120V AC power at 60 Hz- there are two 5-20R 120V receptacles, and a single 12V DC outlet. We do not recommend the 73536i for emergencies or for powering large tools. You can use it to power an electric drill, miter saw, or a 0.5hp air compressor, but that is the limit of this tiny inverter generator. If you need more watts but do not want a noisy open-frame generator, check out the next model on our list — the Champion 100302 RV Ready hybrid generator. 3500-watt Hybrid RV Ready. Champion generator review. Monitors power consumption in real time to reduce electrical load. Efficient mechanical design to decrease the overall footprint and weight by 20 percent. The Champion 100302 is not a traditional open-frame generator, nor is it an inverter generator. Think of this machine as a crossbreed between an inverter generator and a conventional open-frame unit- it carries many of the advanced circuitry components from a more expensive inverter generator, and incorporates these electronic systems into a design that is smaller and quieter than a traditional open frame system. The result is what Champion calls a “Hybrid” model, one that takes the best aspects of both a traditional and inverter generator, and combines these features into an affordable, quiet package that is capable of varying engine rpm to reduce fuel consumption. Yes, the Champion 100302 can vary engine speed based on load, something that traditional open-frame generators are incapable of doing. However, it also costs less than a 3500-watt inverter generator, thanks to the open frame design and omission of certain high-end features found exclusively on inverter generator models. Worry not, for these excluded features have little to no practical impact on the quality of AC power generated by the Champion 100302. You can confidently power delicate electronic devices with this generator, since Total Harmonic Distortion is under 3%, a figure that is practically unattainable for any conventional open-frame generator. Only inverter generators produce AC power of such clean nature, and the Champion 100302 does the same job at a lower price. It is also equipped with Champion’s exclusive “Quiet Technology” which employs specially designed engine components and noise reduction barriers to muffle the noise output. They claim that the Champion 100302 is up to 50% quieter and 20% lighter than a traditional open-frame 3500-watt generator. Runs for 17 hours at 25% load when the 2.9-gallon fuel tank is full. We aren’t so sure about the 50 percent figure, but what we do know, is that this generator produces 64 decibels of noise from a distance of 23 feet. That means it is quieter than the Champion 76533, but louder than the Champion 75537i. The 100302 is equipped with a 2.9 gallon fuel tank and can run for up to 17 hours on economy mode (25 percent load). There is an economy mode selector switch right next to the pull starter cord (this generator doesn’t have an electric start), and we recommend you use the economy mode to reduce noise and fuel consumption while powering smaller appliances such as laptops, phones, lights, etc. The 4-stroke 224cc single cylinder engine uses 10W-30 oil, and oil capacity of this generator is 0.6 quarts. One of the drawbacks of this generator- it does not come with the Intelli-guage digital display that lets you monitor voltage, hertz, and run-time. Intelli-gauge is equipped on Champion generators that also have electric or wireless remote start. The Champion 100302 is RV ready with a 30 ampere 120V outlet (TT-30R), it also features 120V 20A duplex receptacles (5-20R x 2), and a single 12V DC automotive outlet. There is no automatic voltage regulation or fuel gauge, but it does support parallel operation through the Champion parallel operation kit, which you can purchase separately. There is a limited 3-year warranty on the Champion 100302, and you get free lifetime tech support. 3500-watt RV Ready portable generator. Champion generator review. RV Ready and very affordable portable power. Enough power to start and run a 15,000 BTU RV air conditioner. RV Ready : For your RV, you’ll have enough power to start and run a 15,000 BTU RV air conditioner. Durable steel frame can take care of your essentials during an outage – lights, sump pump, refrigerator, modem/router, fan and TV/DVD. ✓ View or download the MANUAL for the Champion 46596. If you are looking for something that is both affordable as well as extremely reliable, then this is it- the Champion 46596 3500-watt generator. It is a standard open-frame generator, so the fuel efficiency is going to be a bit on the lower side and the noise output will be more than an inverter generator. However, for the average homeowner or camper who simply wants a bare-bones 3500-watt power source for running tools or appliances, this generator will do just fine. It is one of the cheapest 3500-watt models on the market, and is RV-ready. Runtime at 50% load is 12 hours, which is amazing for a standard 3500w portable generator. The secret to its higher-than-average fuel efficiency is the cleverly designed 196cc Champion 4-stroke single cylinder engine. This engine spins at a constant 3600 rpm since there are no inverter circuits in this unit, but it consumes less fuel than similarly sized engines found in competing generator models. The noise output is 68 dBA at a distance of 23 feet, similar to the Champion 76533. It is worth noting that the 46596 is a 3500w model, and yet it is as loud as the 76533, which is a 3800w model. The 76533 is EPA and CARB compliant, while the Champion 46596 is only EPA certified. You might want to consider this factor if you plan to use the 46596 in public spaces such as parks. The steel fuel tank holds up to 3.8 gallons of gas, and the engine starts with a pull cord (recoil start). There are two circuit breaker switches (25A and 20A). There are no covered outlets or GFCI outlets, and the 46596 outputs 120V single-phase AC power at a frequency of 60 Hz. There are three outlets – a 120V 30A locking outlet (L5-30R), a 120V 30A RV receptacle (TT-30R), and a 120V 20A outlet (5-20R). The Champion 46596 does not support parallel operation, and there is no fuel gage. However, there is an analog voltmeter and a low oil automatic shutoff system. Champion also installed automatic voltage regulation in the 46596 and its 1” tubular steel frame is powder coated to resist corrosion. Note : the Champion 46596 is not available for sale in California, since it does not pass the local EPA laws for that state. However, if you live in any of the other 49 states, you can purchase this highly affordable and relatively quiet 3500w generator. It comes with a 3-year limited warranty and free lifetime tech support. Product dimensions- 22.8 x 20.9 x 26.8 inches, and net weight is about 99 pounds. Visit Champion’s YouTube channel to view their excellent videos from a wide range of topics related to generators. They clearly care about their brand as they produce high-quality videos that educate andd inform consumers. We highly recommend you visit their channel. Honda is a company that has been manufacturing power tools, engines, and automobiles for over half a century by now. They are almost unrivaled when it comes to expertise on designing and manufacturing small engines for use in products such as lawnmowers, generators, snow blowers, etc. Honda engines are reliable, efficient, and quiet. But over the last decade, some new power tool manufacturers have popped up, and are rapidly gaining popularity in the market with their aggressive pricing and innovative features. One of these new names is Champion. While it is a relatively new company (established in 2003), Champion has impressed residential consumers, industry owners, and commercial businesses with their reliable and energy efficient products that provide amazing value for the cost. Whenever you ask a survivalist, camping enthusiast, or DIY person what his/ her favorite generators are, it is very likely that a Honda model will be up there on that persons list. Whenever you purchase a Honda generator, you are usually guaranteed a product that performs as advertised, is quiet, and fuel-efficient. Honda makes some of the best generator engines, and their build quality is unrivaled. However, not everybody who wishes to purchase a new portable generator can afford to shell out 2000 bucks for a 3000-watt inverter generator (the Honda EU3000iS). In addition, if you are just looking for a standard open-frame generator that puts out 6500-7000 watts, you have to pay close to 3000 dollars for the Honda EM6500S, a non-inverter type generator with a commercial grade Honda engine and electric start. Long story short, Honda generators cost more in comparison to Champion models of similar capacities. For example, the Champion 75537i is a 3100-watt inverter generator and produces 100 extra watts of continuous power compared to its direct competitor, the Honda EU3000iS. Just like the Honda, this Champion generator features automatic voltage regulation, low oil shutoff, built-in transportation wheels, and a folding carry handle. The Honda will run for 7.1 hours on rated load with a full tank (3.4 gallons), and if you switch it into eco mode, it will run for 20 hours at 25 percent load. The Champion 75537i on the other hand, features a runtime of about 8 hours at 25 percent load with its much smaller 1.6-gallon fuel tank. Both generators put out 58 decibels of noise at a distance of 23 feet, although in practice the Champion tends to run a couple decibels louder, especially when you compare it to the Honda in economy mode. Would you pay more than twice the price for a generator that runs a couple decibels quieter and is slightly more fuel-efficient? That’s for you to decide, but if you are someone who uses the generator on a daily basis, you will get more for your money in the long run with the Honda since it performs flawlessly even with maximum rated load, whereas the Champion may shut down as you get really close to its maximum rated load point. The Honda generator is also heavier, with a dry weight of 131 pounds, while the Champion 75537i weighs just 96 pounds. In addition, you have the luxury of wireless remote start with the Champion model, a feature you will not find in the Honda. From our research, it is evident that Champion offers better value for money if you are an average Joe who uses the generator a couple of times each week. Even if you use the generator every single day (you may be living off the grid), we can assure you that the Champion will last several years without a single hiccup if you take proper care of it. Both Champion as well as Honda offer 3-year warranties on their residential generators, and both companies provide excellent customer service. However, when it comes to dual-fuel models, Champion is the clear winner since Honda simply does not have any dual fuel generators that compete with what Champion has to offer (Champion makes over 20 different dual-fuel generator models). If you live on a property with access to a supply of natural gas, we definitely recommend Champion over Honda. If you have the budget for a Honda and need something that performs as promised each time you start it, for years and years on end, then by all means- go ahead and get a Honda. Honda’s are quieter, slightly more reliable, and deliver better fuel efficiency. Champion generators are cheaper, offer interesting features like remote start, one touch digital display control, and you get to choose from a large collection of dual-fuel models. When you walk into a nearby store to purchase a new generator, the sales assistant may ask you whether you need a regular generator or an inverter generator. If you are not familiar with the differences between these two types of generators, it is very likely that you will end up making the wrong call and purchasing a product that does not fit your needs. Both types of generators have their pros and cons, and that is what we are about to discuss. First, you should know a little bit about the two different types of current- AC and DC. AC stands for alternating current, while DC stands for direct current. Almost all of the current generated from power plants is AC current, while DC is the current type generated by solar cells, and batteries. Alternating current is named that way because it periodically reverses the direction of flow, and the number of times it reverses its flow is denoted by Hz. For example, the 120V or 240V AC power that you use in your home or job-site reverses its flow 60 times a second, so it is 60 Hz AC. In the east as well as some European countries, 50-hertz power is used (China, India, Kuwait, Kosovo, Malaysia, Italy, etc.). You can check out the voltage/ hertz figures for different countries across the world on the World Standards website. Direct current always flows in one direction, and a straight line (it is at either zero or full voltage) represents its graph. Most modern electronic appliances are equipped with switching systems that convert AC into DC (TV’s, fridges, computers, etc.). There is such a thing as quality of AC power. Alternating current can be interpreted as sine waves; the positive and negative peaks represent voltage, while the width of each wave gives us frequency. In order for the current to be “clean”, there should be no distortion in these sine waves, i.e. they should be as close as possible to a perfect sine wave. The power that comes out of an alternator consists of square-like waves with sharp edges; this can damage the delicate circuitry within electronic components. In traditional generators, there is not a whole lot of filtering going on after the current comes out from the alternator; the only type of control system is the voltage regulator module, which ensures that the output voltage is within a certain range (110 to 120V). However, an inverter generator contains two additional components- a rectifier, and an inverter. The AC power coming out of the alternator passes through the rectifier, which converts it into direct current, and then this direct current passes through an IGBT inverter which “inverts” it back to alternating current, this is done by maintaining a THD less than 3%. The final AC power is much cleaner than the initial AC generated by the alternator, and you will find that the AC supply coming out of the inverter is much closer to a perfect sine wave (no choppy edges or square waves). Inverters are also capable of modifying output frequency. This allows the engine to slow down or speed up while maintaining a steady 60 Hz power output. Conventional generators always run at 3600 rpm, because they lack inverter circuitry and need to maintain a specific speed so that the alternator can put out a 60 Hz AC supply. Inverter generators can slow down when the load decreases, and speed up when you put a higher load on them. This helps conserve fuel, and reduces average noise output significantly. This is a very important concept to understand before you go ahead and look for a new generator to purchase. Customers are often times mislead by the false advertising manufacturers employ to make people think that a generator outputs more watts than it actually does. What do we mean by this? Let us take an example- the extremely popular Honda EU3000iS inverter generator. On paper, it is a 3000-watt portable generator. However, in reality the rated output or continuous power output of this Honda generator is 2800 watts. Which means this generator can reliably sustain an output of 2800 watts for elongated periods. The 3000-watt figure refers to “peak” wattage or surge wattage. The EU3000iS can only maintain this level of AC power for an extremely short burst of time. Depending on the make and model of the generator, peak or surge output may last as little as 10 seconds all the way up to a few minutes. The point is, when you purchase a generator; always check its “continuous” or “running” wattage. Some manufacturers may refer to this as the “rated” load. So why do generators have this peak wattage system? Is it just a marketing gimmick? Well, in fact peak wattage is an important number if you are not using it as the sole factor behind your generator purchase. For example, the generator you plan to purchase will power a variety of appliances such as TVs, refrigerators, internet modems, Wi-Fi routers, laptop computers, air conditioning units, heaters, etc. However, not every type of load is the same. Some appliances draw a huge amount of power while starting, and once they have started, the power consumption will decrease significantly. There are two major categories for loads- resistive and reactive. Resistive loads require the same amount of power to start and run. Examples of resistive loads : Light bulb, TV, electric grill, microwave oven, etc. Reactive loads on the other hand, require a lot more power to start than they need to run. The starting power can be up to 3 times as much as the running power. Most reactive loads contain an electric motor or compressor unit. Examples of reactive loads- refrigerator, air conditioner, power tools, air compressor, etc. Here is a helpful wattage chart from the Honda site where you can get approximate starting and running watt values for various appliances and power tools. This is a rather simple process. First, you make a list of all the equipment that you plan to power with your generator. For our example, we shall consider an imaginary house with the following appliances- (10x) 60W light bulbs, a flat screen TV, a refrigerator, a microwave oven, a dishwasher, a sump pump, a computer, and a 10,000 BTU window air conditioner. Now, let us make a table with the appliances, and their respective starting/ running watts. Based on the chart, we need a portable generator, which can output at least 5468 watts continuous. Do not worry about the starting wattage, since the highest starting wattage value is the only one that matters (in this case, it is 2200 for the window AC). Do not think you are going to start all the appliances at the exact same time, which will probably overload the generator and blow up the circuit breaker. Another thing to consider is if you are going to run all the appliances simultaneously. Are you going to watch TV while using the microwave? Probably not. Will you use the computer while running the dishwasher? You probably do not use all 10 lights at the same time either. By deciding which appliances you will run simultaneously, and which ones are less important, you can save money and fuel by purchasing a smaller, cheaper generator. Look at this Guide from Honda to understand the concept of power management. What is an RV Ready Generator? What kind of generator am I looking for? The answer to the first question is obtained by looking at the appliances you are going to run. For example, you have a TV, 13500 BTU RV air-conditioning unit, a coffee maker, a 600W RV fridge, and a 650 microwave oven. The 13,500 BTU RV AC will require anywhere between 2800 and 3000 watts to start, the running wattage of this AC will be around 1500 to 2000 watts. If your RV is equipped with a 15000 BTU AC, it will require 3300 – 3500 watts in order to start, and 1300W – 1800 watts while running. The TV is about 200 watts, the coffee maker will take up 600 watts, the RV fridge requires a starting wattage of 600W, and it runs at 180 watts. The 650W microwave will take up nearly 800W or 1000W depending on how efficient it is. So we need a total wattage of 2000W + 200W + 600W + 180W + 800W = approximately 3800 watts running, and at least 3500 watts surge power to start the AC. Now, keep in mind, the average RV owner will not be rolling around with this much hardware. You may need a generator just for the air conditioning unit, or you are camping in January and just need to watch some TV (because nobody uses the AC while camping in January). Decide how much power you need, and keep in mind the starting wattage of your RV AC. If you are purchasing a generator just for running small appliances like a laptop, TV, coffee maker, electric grill, etc. you don’t need a 3000 watt unit. Get something like the Champion 73536i or a Honda EU2000. If you are planning to run the RV AC with your generator, you need at least 3000 watts of continuous power, because we are assuming you will also hook up small appliances like a coffee maker, laptop, lights, etc. to the generator while it is powering your AC. In that case, we recommend the Champion 75537i inverter generator. If you need even more power, check out the Champion 100302 Hybrid RV Ready generator. You can also buy a couple of 2000-watt inverter generators and hook them up in parallel. This gives you 4000 watts of power, and the parallel setup will probably cost less than a single 3500-watt inverter generator. However, there are downsides to running a parallel setup comprised of two smaller generators- you double the maintenance and it is easier to steal one if you are using them in a public camping ground. Which is why we recommend that you chain your generators to the back of your truck instead of leaving them out there on the ground. You can also invest in a generator cover to protect it from the elements, and bugs and anything else that might damage it. The answer to the second question is a quiet generator. You do not want to go around scaring people and animals in the camping ground with your obnoxiously loud open-frame 7000-watt construction grade generator that costs less but generates the same amount of noise as a rock concert. There is a reason people purchase inverter generators for camping- not only do these generate cleaner AC power for your laptop and smartphone, but also they are significantly quieter than open-frame models. Alternatively, you can go with a Hybrid model from Champion. These open-frame generators incorporate advanced inverter circuitry to offer the best of both worlds. They are cheaper than inverter generators of similar capacity, but deliver clean AC power (less than 3% THD), and are much quieter than standard open-frame units. Check out the Champion 100302 and Champion 100371 Hybrid 4000-watt generators (3500w running). Both of these hybrid generators operate at 64 decibels (distance of 23 feet), and can be hooked up with a second generator in parallel. You can choose to go with a single 3500w model, or dual 2000w generators. The parallel setup will cost more to maintain, and generate more noise (twice the generators, twice the noise). However, this is a cheaper setup compared to a single 3500W inverter generator, and you always have a backup generator if one of them fails. Finally, make sure that the generator you purchase for your RV comes with a built-in 30-ampere 120V RV receptacle (TT-30R). You might also want to check out these extension cords for RV generators- Conntek 14360 (30 Amp, 10 feet) and Conntek 14368 (30 Amp, 25 feet). Electric Start/ Remote Start: Generators with electric start are much more convenient to use, and this feature comes in handy when you do not want to stand in the rain or snow for 5 minutes trying to yank on the starter cord of your generator. Remote start is a feature found mainly on Champion generators, particularly the inverter generator models that are equipped with the Intelli-gage digital display on their control panels. Low Oil Shutoff: This is a mandatory feature on any modern portable generator, be it a regular open-frame unit or an advanced inverter type. Whenever oil levels get too low, the generator engine will shut down to avoid damage and overheating. Fuel Gauge: Some generators have a see-through window on the fuel tank, while others have a digital display on the control panel, which shows the percentage of fuel left. Knowing this is important, it allows you to plan refueling breaks, and ensures that the air conditioning unit and lights do not go down in the middle of the night while you are out camping in the woods. Dual Fuel Operation: Some generators are capable of running on gasoline as well as propane. Propane is a wonderful alternative fuel since it burns cleaner and is easier to store. Campers usually carry propane tanks around to power heaters and cookers. If your generator is capable of using propane, you can carry just one type of fuel for all your equipment. Wheel kit: Moving a 2000-watt inverter generator is easy because it typically weighs around 45 pounds. However, if you own a 3500 or 4000-watt generator, make sure it either has built-in wheels or comes with a wheel kit. You certainly do not want to try lifting 150 pounds of generator by yourself, especially if you are not in peak physical condition. Handle: Same idea as wheels, a handle really helps with moving the generator around from one place to another. Smaller generators have carry handles on the top, while larger generators have folding handles that rise up whenever you have to push or lift the generator. Always store the gas in storage-approved containers- Do not try to feed your generator with gasoline from water bottles and milk jugs. Always store gasoline in a safe manner, using containers designed specifically for fuel storage. If you do not plan to use the fuel within a month, we highly recommend that you add fuel preservative compounds to the gasoline. This will prevent the chemical structure of the gas from degrading. Not only is old gas harder to burn, but it will also clog up the innards of your generator engine making it harder for you to start the unit. Keep engine oil and extra air-filters nearby – Whenever you operate a generator; make sure to have an adequate supply of engine oil. Depending on the make and model of the generator as well, as how long you use it for, oil will last anywhere between 25 and 100 hours. If you are running the generator continuously, oil changes will happen more frequently. Check the owner’s manual to ensure that you are using the right kind of engine oil. Some generator manufacturers recommend that you use a heavier oil during the summer and a lighter oil during winter season. Certain synthetic oils are all-season. If the generator is equipped with an air filter, take it out every couple of weeks to check if everything is nice and tidy. With paper-based air filters, you might need to replace them with new ones. You can clean foam-type air filters with soapy water and leave them out in the sun to dry. After they dry, apply the appropriate air filter oil on them. Check the user manual to know what type of air filter your generator uses, and how you can clean it. Use a heavy-duty cord – Use heavy-duty 10-gauge extension cords for running appliances up to 100 feet away from the generator. Heavy-duty cords ensure less voltage drop, since they are more conductive. Lighter cords are cheaper but will harm your appliances in the long run, because the voltage drop might cause premature motor burnout. Combine security and electrical safety – If you use your portable generator for home backup and typically leave it outside, we suggest that you combine an eye bolt and steel chain to create a security mechanism that also acts as the grounding. To do this, dig up a hole. Insert a grounding rod and eye bolt, and then fill up the hole with concrete. Cover up the whole thing with 4” ABS plastic or some PVC drainpipe. Add a screw-on clean-out fitting. Connect the ground wire to the grounding rod, and secure the generator to the eye bolt with a steel chain and padlock. What to do if the generator will not start? If the generator hasn’t been used in months and is not starting up, there are a few things you can do to fix the issue. First, you need to drain all the old gasoline from the tank. When you drain out the old fuel, you must do so by disconnecting the fuel line from the carburetor. Let the old fuel drain into an old oil container. Next, you need to drain all the engine oil if you have not replaced it since you last put the generator away. Remove the plug at the bottom of the engine, this should allow all the oil to drain out. Reconnect the fuel line to the carburetor and reattach the oil plug to the engine. It is now time to check the spark plug. Read the user manual to see where the spark plug is located on your specific generator model. If it is an open frame generator, the spark plug should be relatively easy to access. On inverter generators, you will have to remove the engine cover before you can access internal components. Check the spark plug; see if there is carbon deposition on the business end. If it looks clean, reattach it, if it is burnt out you will have to replace it. Next, you have to check the air filter and make sure it is not clogged up with dust and dirt. If the filter is dirty, follow the steps in the user manual to clean it. Once you have done all this, it is time to refill the generator with fresh gas and engine oil. Before you do so, add some fuel stabilizer to the gas tank. Then fill it up with fresh ethanol-free gasoline. Add fresh engine oil. Now the generator is ready to be started. Take it outside, set the choke to closed (“on” position), and tug on the starter cord until the engine starts to “pop”. Once it is running, open the choke (set it to the “off” state) and the engine should rev up to full speed. If you do not plan to use the generator for at least 2 weeks, make sure to run it dry. Take it outside, start the engine, and shut the fuel valve while the engine is still running. This will clear the fuel lines and carburetor, and prevents leaks. Make sure to “exercise” your generator if you do not use it very often. What this means is, you take out the generator once every month and run it for about 20 minutes. This procedure will ensure that the engine stays lubricated, and there is no moisture in the fuel lines. It will also recharge the battery (if your generator features electric start).